Check out our Discorsi ex Colleges colt, purchased as Lot 22 at the 2017 Yarradale Stud Yearling Sale. DISCORSI (AUS) (Bay 2003-Stud 2010). 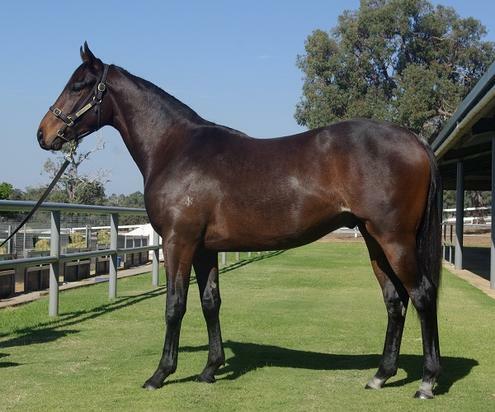 2 wins-1 at 2-at 1400m, 1600m, A$119,215, VRC Gibson Carmichael S., L. Sire of 97 rnrs, 46 wnrs, inc. SW Man Booker (Western Australian Guineas, Gr.2), SP Settlers Creek and of Salorsci, Full Disclosure, Mrs Brown's Boy, Angelic Angel, Disco Riffic, Disco Smile, Barrettstown Boy, Card Knight, Disco Metal, Discoville, Klondike King, Slick Talker, La Bionda, Lord Devoutly, Sense of Power, Talking Dancer, etc. Mongolian Warlord (g. by War Chant). Winner at 1100m in 2016-17 in Aust. Plague Stone (Lonhro). Placed at 2 in 2017-18, 2d MRC Blue Diamond Prelude (c&g), Gr.3, ATC Golden Gift 2YO P.
Benenden. 5 wins from 1200m to 1600m, A$199,585, MRC Melinda Rea H., VRC Spotless H., MRC Wafex Sovereign H., 2d MRC Melbourne Horse Transport H., MRC (Mornington) Sportingbet's Owner's Privilege H.
Braxton. 2 wins-1 at 2-at 1400m, 1700m, R189,450, to 2017-18, Vaal Next Race Meeting Thursday H., 2d Vaal Racing Association 3YO H.
Sparsholt. 4 wins from 1000m to 1600m, A$80,940, to 2016-17 in Aust. IN THE WINGS (Sadler's Wells). Joint Head of The 1990 French 4YO+ Free H. 7 wins-2 at 2-from 1200m to 2400m, £889,036, Breeders' Cup Turf S., Gr.1, Grand Prix de Saint-Cloud, Gr.1, Epsom Coronation Cup, Gr.1, Longchamp Prix du Prince d'Orange, Gr.3, Prix Foy, Gr.3, Deauville Prix du Haras de la Huderie, L, Chantilly Prix de Vineuil, 2d Longchamp Prix Ganay, Gr.1, 4th Prix de l'Arc de Triomphe, Gr.1. Successful sire. MOROZOV (Sadler's Wells). 5 wins from 1850m to 3100m, €198,375, Longchamp Prix Hubert de Chaudenay, Gr.2, Prix de Barbeville, Gr.3, Prix du Lys, Gr.3, Saint-Cloud Prix Opott, Maisons-Laffitte Prix Saint-Simon, 2d Longchamp Prix Vicomtesse Vigier, Gr.2, 3d Deauville Prix Kergorlay, Gr.2, Longchamp Prix Niel, Gr.2, Prix de Suresnes, L, 4th Longchamp Prix Hocquart, Gr.2. Sire. ALEXANDROS (Kingmambo). 8 wins-3 at 2-from 1200m to 1800m, £124,198, €142,205, 3,061,760Dhs in GB, France and U.A.E, Deauville Prix de Cabourg, Gr.3, Longchamp Prix Roland de Chambure, L, Meydan Al Rashidiya S., L, Nad al Sheba Park Lane Trophy, Al Tayer Motors H., Saint-Cloud Prix Beachcomber Hotels Royal Palm Luxe, 2d Newbury Lockinge S., Gr.1, Meydan Jebel Hatta S., Gr.2, Epsom Diomed S., Gr.3-twice, Goodwood Thoroughbred S., L, Saint-Cloud Prix Hunyade, 3d Nad al Sheba Dubai Duty Free, Gr.1, Deauville Prix Morny, Gr.1, Munich Grosser Dallmayr Preis, Gr.1, Newmarket Ben Marshall S., L, Doncaster Frank Whittle Partnership S., 4th Chester Dee S., Gr.3. Sire.